Psalm 1 compares the righteous person to a tree planted by the water. 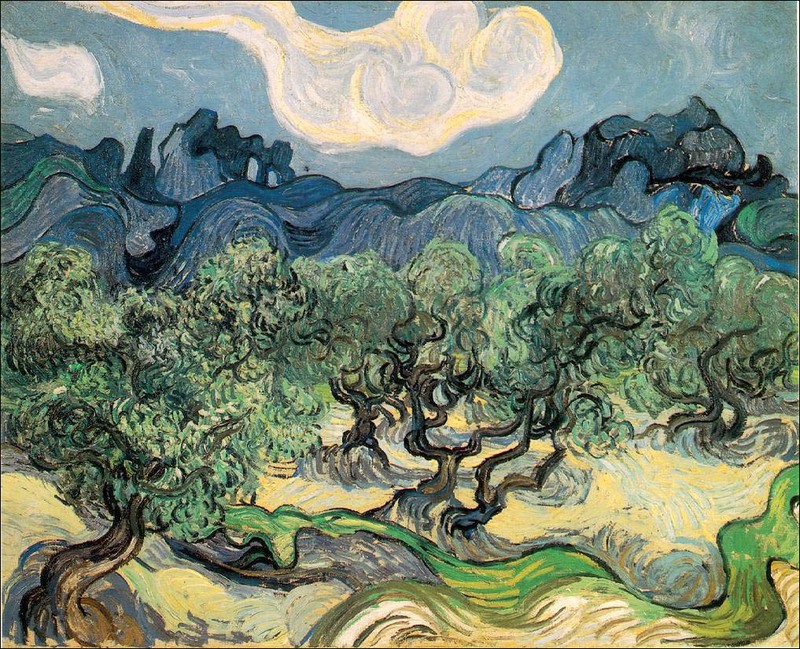 Vincent van Gogh, "Olive Trees with the Alpilles in the Background" (Saint-Remy: June, 1889). 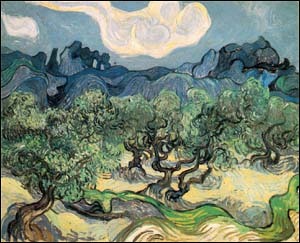 Oil on canvas, 72.5 x 92.0 cm, New York Museum of Modern Art. Larger image. Our next group of psalms -- Wisdom Psalms 1, 15, and 133 -- seem to share some characteristics with the Bible's Wisdom Literature, such as Proverbs. They urge believers to righteous living, provide warnings to avoid evil, and exalt the beauty of right relationships. Āshar isn't a bad word or an inferior blessing, it just has a different connotation than bārak. This isn't an extraordinary, miraculous blessing of Yahweh -- though God is fully capable of miraculous blessing. It is the normal result of a life lived for God. Missionaries have observed a phenomenon of "redemption and lift." The first generation of Christians in a new area may be dirt poor. But the second generation of Christians -- the children of the first generation -- are quite likely to be more prosperous than the dirt-poor non-Christians in the community. Since they've adopted a godly lifestyle, stopped getting drunk, doing drugs, and gambling they've been able to see the prosperity that comes naturally from a life well lived. Happy, to be congratulated, is the person who ... delights in the law of the Lord, rather than be under the influence of sinners and sinful ways. The righteous person cherishes the Torah, and by extension, all of God's Word. "Delight" (ḥēpeṣ) functions as a verb in this sentence. The basic meaning of the root is to feel great favor towards something. The object solicits favor by its own intrinsic qualities. The verb means "to experience emotional delight. "4 In our verse then, the righteous man takes emotional delight in the law of the Lord. It is the "way" that is the focus of this verse. Derek, "way, road," is a very common Hebrew noun. Beyond a literal path worn by constant walking, it is commonly used figuratively to refer to the customary actions or behavior of a person.7 A dynamic translation here might be "lifestyle." Above you can see the clear positive/negative structure of this psalm. The positive is highlighted in green, the negative in red. Once you learn to recognize parallelism in the Bible, you'll begin to appreciate the poetic beauty of a psalm as well as its teaching. Psalm 1, however, doesn't show simple antithetic parallelism, but whole verses that are positive followed by others that are negative, a intricate interweaving that enhances the beauty and power of this psalm. In the arid climate of Israel, consider the beauty and calm pictured by a vigorous tree planted next to a water-channel,9 that bears fruit regularly and not a bit of withering of its leaves, no matter how dry the summer. Its roots go down deep. So long as the water keeps flowing, it will be healthy. The water in this figure would probably be God's word, or the Lord himself. I shall not be moved." The second image in our psalm is of chaff being blown in the wind. Chaff is the paper-thin membrane surrounding the grain. It is removed before the grain is ground to make flour. The ancient Hebrews would gather the cut and dried wheat stalks into a flat area, best in a breezy area, and physically remove the chaff from the wheat by driving a donkey over it pulling a sled or log. Now the grain and chaff would lie together on the threshing floor. To separate the two, the farmer would use a pitchfork, called a winnowing fork, to throw the straw into the air. The breeze would blow away the light straw and the paper-thin chaff, while the grain would fall back to the ground by itself, where it would be collected and stored. Q1. (Psalm 1). This short psalm seems to reaffirm what we already know: the righteous will succeed and the wicked will perish. Why do we need to be reminded of this? From an emotional standpoint, what lines in this psalm stand out to you. Why do you think you like them? Sometimes Christians are afraid to talk about righteousness. They are either too judgmental and self-righteous that they can't see straight or they are so quick to talk about grace not works so that righteous living doesn't seem to matter much. But the Bible has a lot to say about righteous living. Why? Because in our world -- as in the ancient world -- there are far too many people who live for themselves, shade the truth, cut corners where they can -- and call themselves Christians. Just what is a righteous person? This psalm of David considers the question. The real question here is: Who can dwell in God's presence? The answer is, someone who is conscientiously trying to live as God commands. Is that too much for us to handle? Yes, we are imperfect and need forgiveness. There are other psalms that explore grace and forgiveness, but this psalm is talking about the lifestyle of one who claims to be a believer. "Who may ascend the hill of the LORD? What are those things? David doesn't give us an exhaustive list, but rather some earmarks, characteristics, of a person who is seeking to please God. The imagery in this psalm isn't complex. It is of a tent, a dwelling place on a hill where God lives. Who can live in the same tent with God day by day? Can you? Can I? What does it take to live with God? The first triplet or three parallel lines talk about inner integrity. Verse 4 may trouble Christians who have been taught by Jesus to love their enemies. It seems to suggest hate. Or does it? Again and again we see this idea in the Psalms: "Turn from evil and do good...." (Psalms 34:14; 36:4; 37:27; 101:3; 119:104, 163). We live in a tolerant society that teaches us to overlook sin, to call evil "good" and good "evil." Intolerance in our society is considered an evil. Yes, there is a kind of proud judgmentalism that we must avoid. But we believers must not be tolerant of evil or regularly associate with evil people. We must stand clearly for the right. We are on God's side unashamedly! That doesn't mean that we can or should be complete separatists or hermits. We must live in society (1 Corinthians 5:1-13, especially 9-10). But we must be crystal clear about our allegiance. The next characteristic of a righteous person is keeping his word, even when it is difficult to do so. All healthy human relationships are built on trust, require trust. We serve a God who is faithful to keep his word. It follows that a follower of the Lord will take pains to keep his promises, even though that later becomes costly. Money-lending in ancient times wasn't thought of as funding for capital expenditures such as a house. Instead, it was a last resort for a poor person who didn't have any other choice. The Mosaic Law didn't forbid all money-lending at interest (Deuteronomy 23:20; Matthew 25:27), but in the strongest possible terms it condemned money-lending designed to take advantage of a poor brother's extremity. Thus the righteous person described in the psalm lends money as an act of charity, not business. Nor does he accept a bribe to act unjustly. Only a person who has money clearly submitted to God can walk righteously before him. The final lines remind me again just a bit of the African American spiritual based on Psalm 1 that we just studied: "Like a tree planted by the water, I shall not be moved." Q2. (Psalm 15) The Wisdom Psalms are meant to instruct us. How would you use this psalm in your family to instruct your children? What topics of right living does it cover? Our final psalm in this lesson doesn't speak of justice, but of the rightness and beauty of unity. It is a psalm "of David" and is called "a song of ascents," traditionally sung as pilgrims approached Jerusalem as they went up for a feast. down upon the collar of his robes. What stands out to me about this psalm is its startling imagery. The key term here is "yaḥad, "unitedness, union, association, community. "18 Every other phrase in this short psalm amplifies and informs this word. This now is our "prime directive." So to reinforce this value in our hearts, let's consider Psalm 133 carefully, taking time to allow its words and images to settle in our hearts and affix themselves to our souls. The word "pleasant" (nā`īm) is a close synonym. It means "sweet, lovely, agreeable. "20 The root is used to describe David as the "sweet" psalmist of Israel (2 Samuel 23:1), the physical beauty of two lovers in the Song of Solomon (1:16; 7:6), for the taste of bread (Proverbs 9:17) and the music of the lyre (Psalm 81:2). "Oil" (NIV, NRSV) or "ointment" (KJV) is the common word shemen, "oil," either of pure olive oil or prepared for various uses such as perfume or ointment. Kings and priests were anointed with oil and it became important in cosmetics and perfumery. Oil became a symbol of prosperity and blessing (Deuteronomy 32:13; 33:24; Psalm 92:10). It is referred to as "the oil of joy" (Isaiah 61:3; Psalm 45:7). An honored guest would be anointed with oil as an act of generous hospitality, as in the 23rd Psalm: "You anoint my head with oil; my cup overflows" (Psalm 23:5). In Jesus' day, putting oil on a guest's head was considered the act of a gracious host (Luke 7:46). But in Psalm 133, this wasn't just olive oil. It was "precious" oil, probably perfumed. The adjective here is ṭôb which we saw in verse one, in the sense of "beautiful, expensive." The New Jerusalem Bible renders it "fine oil." And it wasn't just "a little dab will do you." This oil is poured21 until it begins to run off the hair and down onto the beard, and then even onto the recipient's robes.22 I would worry about staining my clothes. But the figure here is used to suggest abundance, extravagance, overflowing blessing. Aaron is mentioned because he was anointed as high priest by Moses (Exodus 30:25-30; Leviticus 8:12). Q3. (Psalm 133) What about this short psalm seems to attract you? Why is "dwelling together in unity" so difficult? What kinds of commitments does unity require of us? How do the principles of unity and purity seem to conflict with each other? Why are reconciliation and unity such high values in Jesus' teaching, do you think? Dear Lord, we thank you for the encouragement to righteous living that you give us in these psalms. Help us to be diligent to obey you. Also help us to be diligent to seek unity, rather than just to judge, condemn, and separate. Teach us how to love -- to love you and to love our neighbors. In Jesus' name, we pray. Amen. "Can I Ascend," words and music by Matt Redman (© 1995 Thankyou Music). Psalm 24:3. "Clean Hands and a Pure Heart," words and music by Dale Garratt (© 1980, Scripture in Song). Psalm 24:3-5; 2 Chronicles 16:9. "Give Us Clean Hands," words and music by Charlie Hall (© 2000, worshiptogether.com songs). Psalm 24:3-5. "�Miren Qu� Bueno! (O Look and Wonder)," words and music: Pablo Sosa (1979), translated by George Lockwood (© 1979 Cancionero Abierto, Buenos Aires). Psalm 133. "Who May Ascend to the Hill of the Lord?" words and music by Kirk Dearman (© 1989, Maranatha Praise, Inc.). Psalm 24:3-5. David M. Howard, Jr., "The Psalms in Current Study," in Interpreting the Psalms, p. 25. Gerald H. Wilson, "The Structure of the Psalter," in Interpreting the Psalms, p. 232-233. There are three distinctions between the use of bārak and āshar: (1) Bārak is never used to bless God or in God's mouth to bless people. It may be that ´āshar is reserved for man as a word of envious desire, "to be envied with desire is the man who trusts in the Lord." (2) Bārak can be a blessing from God that man doesn't deserve, but to be blessed (´ashrê), man has to do something. (3) Bārak is a benediction, ´āshar more of a congratulation (Victor P. Hamilton, bārak, TWOT #183a). Leonard J. Wood, ḥāpēṣ, TWOT #712b. Herbert Wolf, hāgā, TWOT 467. John E. Hartley, ṣālēaḥ, TWOT #1917. Herbert Wolf, dārak, TWOT #453a. On this special use of yāda`, Craigie (Psalms 1-50, p. 58) cites Dahood, Psalms, I, 5. "Care about, be concerned about" ... "take care of, take up the cause of" (Yāda`, Holladay, p. 129, meaning 7.a.). Peleg, means "artificial water-channel, canal" (Holliday 292). Jack P. Lewis, ´āhal, TWOT #32a. J. Barton Payne, tāmam, TWOT #2522d. Harold G. Sitgers, ṣādēq, TWOT 1879a. Our word "Amen" comes from the same root ´āman. Jack B. Scott, ´āman, TWOT #116k. Holladay, p. 332; Kidner, Psalms 1-72, p. 81. Bruce K. Waltke, bāzā, TWOT #244. The "vile person" (KJV, NIV) or "wicked" (NRSV) is mā´as, "refuse, reject." Holladay, p. 180b. Paul R. Gilchrist, yāḥad, TWOT #858b; Holladay 132b. Andrew Bowling, ṭôb, TWOT #793a. Marvin R. Wilson, nā`ēm, TWOT #1384b. The word "poured" is implied. It isn't in the Hebrew text. "Skirts" (KJV) or "collar" (NRSV, NIV) is peh, "mouth," here used figuratively of the top opening of the robe (Victor P. Hamilton, peh, TWOT #1738). George Adam Smith, The Historical Geography of the Holy Land (Seventh Edition; New York: A.C. Armstrong and Son, 1900).